JUST ONE VISIT PER MONTH COVERS THE COST OF SUBSCRIPTION AND MORE! Step 1. 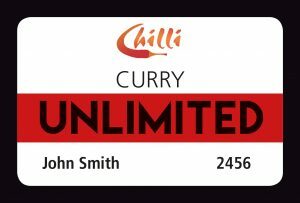 Apply for your Curry Unlimited card online, or in Chilli when visiting. Please read t&c’s. Step 2. Fill in personal and CC details for the monthly subscription. Step 3. Use your Gocardless Confirmation once your funds have been deposited to dine in.Your card will be ready to collect in store next time you dine in. Step 4. Bring your card into Chilli each time you visit and present to your server upon arrival. Step 5. Pick any main + accompaniment from Chilli a la carte menu and GET IT FREE OF CHARGE as many times as you like for the whole month. Step 6. Wash down your curry with a cold beer or a glass of wine and feel AWESOME!